If you are looking for a reasonably priced printer that can serve office needs like printing, scanning, copying and faxing, HP Officejet 5740 can be a good option. Apart from the multifunctions, the device offers to print from a variety of mediums that have become essential for modern day businesses. As the fax function is also integrated, this device is slightly heavier than other Envy products with a weight of 7.67 kg. Further, the dimensions correspond to 17.9 x 16.1 x 7.6 inches (WDH). It prints faster than other HP Envy devices with mono printing speed going up to 22 ppm and colour printing speed going up to 21 ppm. A 2.65 inches LCD touchscreen eases the printing operations with user-friendly navigation. HP Officejet 5740 e-All-in-One ink cartridges are not available for individual installation. Options for wireless printing have been made ampler with Ethernet, WiFi and WiFi Direct. When it comes to printing from different media, it can be done through Cloud, mobile devices, PC and memory cards. The scanner and fax can work as a standalone machine. An input tray that can hold up to 125 sheets sounds to be a good deal, especially for home office. The printer is compatible with Windows and Mac operating systems. 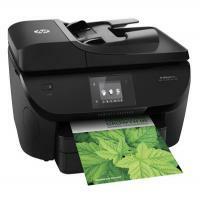 HP Officejet 5740 e-All-in-One offers a comprehensive multifunction solution to meet small office needs. The automatic duplexing, ADF, Cloud printing, Ethernet, NFC and Fax are some of the most prominent features of the printer that genuinely sets it apart from other printers of the same range. The cost on HP Officejet 5740 e-All-in-One ink cartridges can be significantly reduced if compatible counterparts are used. To be very clear, this machine can turn out to be the best bet for home office users more than the small office users. How to align HP Officejet 5740 e-All-in-one ink cartridges in the HP printer? Alignment of ink cartridges is necessary to obtain the high-quality prints. Each time you remove and install the ink cartridge, the printer will prompt the message to align ink cartridges. You can align the ink cartridges using printer software or using printer display. Load A4 size plain paper in the input paper tray. Depending on the operating system follow the steps accordingly. Click Print, scan, and fax. Select maintain your printer and access the printer toolbox. In the printer toolbox, click align HP Officejet 5740 e-All-in-one ink cartridges on the device service tab. Follow the on-screen instruction to complete the alignment. Open the HP utility window. Click align HP Officejet 5740 e-All-in-one ink cartridges on the device service tab. Further, follow the on-screen instruction to complete the process. Load the A4 size plain white paper in the input tray. Touch setup from the printer control panel. Follow the instruction on the screen to complete the alignment process. How to solve paper-feed problems in HP printer? Identify your problem and follow the steps accordingly. Load the paper properly in the input tray. Fan the paper so as to separate each paper individually. The paper-width guides must be set to the correct markings in the tray. It should be according to the loaded paper size. The paper guides must not be tightly fixed against the stack. Avoid using curled or wrinkled paper. The paper loaded should be aligned with the paper-width guides. It is recommended to load the paper into the printer only when it is not printing. The paper-width guides must be set to the correct markings in the tray. Fan paper before placing it in the input tray. Use good quality paper. Avoid using wrinkle paper. Q. What is the maximum monthly duty cycle of the HP Officejet 5740 e-All-in-One printer? A. This printer has maximum the monthly duty cycle of 1000 pages However, it is recommended that the monthly volume is between 300 - 400 pages. Q. Do you sell any types of media or paper supported by the HP Officejet 5740 e-All-in-One printer on your website? Q. What all is included in the box of the HP Officejet 5740 e-All-in-One printer? A. You will receive the HP Officejet 5740 e-All-in-One main unit, a set of starter HP Officejet 5740 e-All-in-One Ink Cartridges including HP 62 Setup Black Ink Cartridge (Capacity of 200 pages) and HP 62 Setup Tri-color Ink Cartridge (Capacity of 165 pages), Software CD, Setup Instructions, Power cord and a Phone cord in the box of this printer. Q. Can you guarantee the security of my credentials if I conduct a transaction for HP Officejet 5740 e-All-in-One Ink Cartridges? A. If you purchase HP Officejet 5740 e-All-in-One Ink Cartridges or any other product from this website, the payment will be hosted by Sage Payments to ensure maximum security of your credit/debit card details. The information provided by you during the transaction will remain protected and no third party will have access to it. Q. I currently reside in Belfast. Is it possible for you to deliver your compatible HP Officejet 5740 e-All-in-One Ink Cartridges here? A. Yes, we deliver our products to all areas of the Republic of Ireland and Northern Ireland. Q. Is it possible to use compatible HP Officejet 5740 e-All-in-One Ink Cartridges along with original ink cartridges for printing? A. Yes, you can use our compatible HP ink cartridges and original HP ink cartridges simultaneously with this printer. You will not face any issues while printing.